Sometimes it’s fun to let your kids take the lead and see what happens. I shot this when I was downtown with my wife and kids one warm November afternoon (a phrase that you wouldn’t hear too often back in Minnesota where I was born) on a fact-finding mission to the bike shop to see how much it would cost to repair my bicycle that had developed a pretty bad wobble in the rear wheel. After we dropped the two-wheeler off my wife went to another shop to look at clothes while I took the boys on a short walk just because it was nice out. 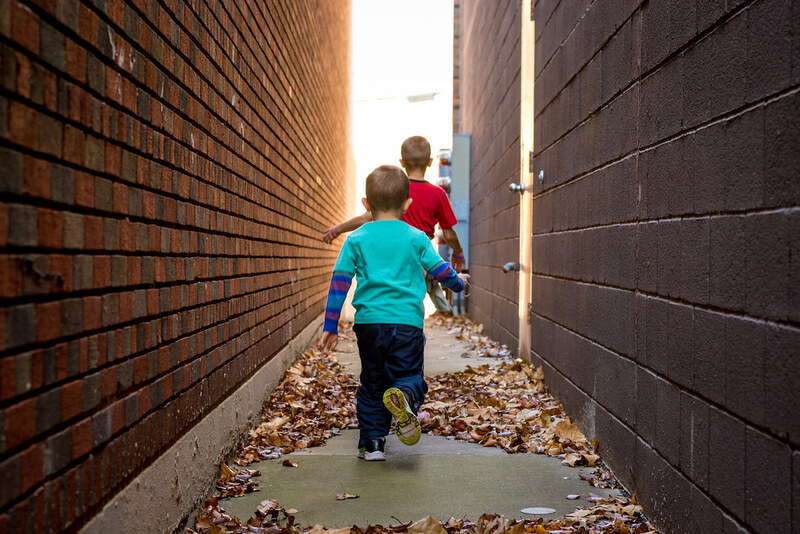 We were thinking about going to a winter display that the city had set up a few blocks away but with kids it’s more about the journey than the destination, so when they asked if they could take a detour and explore a long space between two buildings I figured…well why not? This photo also illustrates a big reason why I use auto-ISO in just about every shooting situation. The ISO performance of modern cameras is so good that, in my opinion, it’s just not worth worrying about anymore. I almost always use a minimum shutter speed of 1/160 (or faster) so I’m confident I will get as little motion blur as possible, which means all I need to do is set the aperture on my camera in order to get the right depth of field. As I pulled out my camera in is concrete-and-brick hallway I quickly dialed in an aperture of f/4 and let my camera take care of ISO and shutter speed, and the results speak for themselves. And for the record there are still instances when I like to take full manual control over my exposure settings, but honestly most of the time I just like to get on with my day, and get back to playing with my kids, rather than fiddling with buttons and dials on my camera. I think the image captures your boy’s excitement for life. Great shot. Sometimes you just have to let kids be kids. I love that you let your camera do the work, but following the guidelines you have set. Why overthink it. Let the camera do it’s job. Exploration, huh? Just the thought of kids exploring unknown territory brings back so many memories of my childhood. Next time you’re back in the old hood, you should take the boys exploring in and around Havelock. And don’t forget to make the Havelock tunnels apart of that journey. Of course, as a kid, I explored not only the tunnels at Ballard, but also the ones down at the “ditch.” And then, there was Bloody Mary’s, Pigman’s, Dog Lake, Stephen’s Creek, Dead Man’s Run, the Steam Tunnels of Ag. Campus, Welcome to your Death, and last but certainly not least, Hobbitsville. All hail, Simon, for bringing back those memories!! Aww! Following Big Brother on an adventure!